I have a friend who often likes to joke about the pointlessness of dual cameras. And even though I know his jabs are often said in jest, there’s a bit of truth in there too. I mean really, how much better is two cameras than one? Well just as we were getting used to two cameras, Chinese phone giant Huawei is kicking off a whole new race to fill the entire backside of phones with cameras starting with the triple cam arrangement on the new P20 Pro. Available in standard and Pro variants, the P20 feels like Huawei is attempting to cram every major tech trend into a glorious feature fiesta that can please even the most demanding hypbeast. Like seemingly every new flagship phone, the P20 sports a glass-sandwich design with minimal bezels, a fingerprint reader, a notch cut out of the top display, no headphone jack, and a bunch of AI smarts inside. And I alluded to before, the Pro model takes things even further with not one, not two, but three rear cameras. Even the P20 Pro’s colorways are especially swanky thanks to a pair of stunning finishes that uses color-shifting gradient like you used to see on cars with the chameleon paints jobs that were all the rage back in the mid 2000's. Really, the only fashionable feature missing from the P20 is some kind of 3D face-scanning tech like you get on the iPhone X. Instead, Huawei settled for a much less sophisticated (and less secure) 2D face unlocking system. But hey, at least it’s fast, so there’s that. From left to right: the flash and new color temp sensors, the 20-MP monochrome cam, the 40-MP RGB cam, and the finally, the 8-MP 3x optical zoom cam. All joking aside, Huawei’s fervor to push every aspect of the phone to its limits could result in some pretty important advancements for the smartphone industry as a whole. The most obvious example of this is the P20 Pro’s triple rear cameras, which is comprised of an 8-MPl sensor with a 3x optical zoom, a 20-MP monochrome sensor, and a whopping 40-MP main RGB sensor. Now some people might balk at a phone camera with a resolution that high, because simply chasing more megapixels isn’t always a productive way to improve image quality. However, that increased resolution also comes with an increased sensor size, that according to Huawei is more than twice as big as the main cam in the iPhone X, and 170 percent larger than the one in the Galaxy S9. The P20 Pro is on the left, the standard P20 is on the right. Then you add in a new laser autofocus system with an improved range of nearly 10 feet (three times farther then before), a new color temperature sensor for more accurate white balance, 960 fps slow-mo like you get on the Galaxy S9, and a 3x zoom that’s 1x better than Samsung and Apple’s best, and you’re looking at some pretty serious camera specs. Meanwhile, on the inside, Huawei has continued to work on its AI image wizardy too. Not only can the P20 identify more individual objects like a cat or a dog than the Mate 10 Pro could last fall, the phone can now recognize entire scenes like blue sky or nighttime and adjust the camera’s settings to match. Huawei is touting the P20 as having a 5x hybrid zoom, but the 3x optical zoom part of that equation is the real thing worth caring about. But the P20's wildest claim might be the phone’s new AI-enhanced stabilization that lets you take handheld long exposure shots of up to four seconds without showing a hint of shake or motion blur. It’s a feature that sounds almost too cool to be true, as it would let the average person capture dramatic nighttime shots without needing to carry around a big, expensive camera and a tripod all the time. But unfortunately though not entirely unexpectedly, that is the one feature I didn’t actually get to use during my brief time testing out the phone. That’ll have to wait for the review. As for the camera on the standard P20 , which stands at just 20-MP rather than 40, Huawei says its big 1.55 micron pixels (22 percent larger than the S9's 1.4 micron pixels) give it an edge in low-light against pretty much every other phone on the market. After all, larger pixels can soak up more light than smaller ones, which theoretically should improve the quality of photos taken in the dark. Notch or no notch, the choice is yours. That said, the P20 and P20 Pro aren’t phone that have traded in all of Huawei’s traditional tricks in for the sake of the camera. Take that notch up top for example. Out of the box, it looks like every phone with a weird new hairdo. but if you want, there’s a setting that let’s you put some black bars up top instead, so it looks a little less annoying (if you’re the kind of person that doesn’t like how the cutouts look). And if you look at the phone’s top edge, Huawei even included a built-in IR blaster for controlling your TV, which use to be a mainstay of many flagship phones, but has become a rarity nowadays. 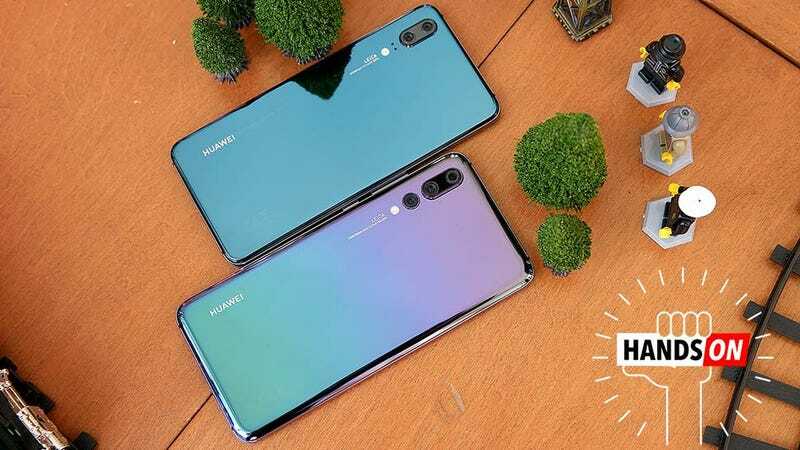 As for the guts, those aren’t half bad either, with the P20 sporting Huawei’s own Kirin 970 CPU, 4GB or 6GB of RAM (depending on the model) and 128GB of storage standard. Hey, it’s an IR blaster. I haven’t seen one of those in a while. That said, the one quirk I’m still not sold on is the P20's front fingerprint sensor. I feel like if a company is going through the trouble of adding notches to increase screen real estate, it might as well go all the way and put the fingerprint reader on the back too. However, it seems Huawei doesn’t quite agree, as senior director of product marketing Steve Lai told me the front fingerprint reader is a hereditary nod to P-series phones of previous years. Aside from having one less camera in the back, the main difference the standard and pro models is that the basic version features a 5.8-inch LCD displays and a smaller 3400 mAh battery versus the P20 Pro’s 6.1-inch OLD screen and massive 4,000 battery pack. For folks outside the US, we’re still waiting for official price and availability info. But now comes the sad part. As exciting and audacious as the P20 sounds, especially that camera packed pro model, Huawei has no plans to bring it to the US. On one hand, you could say that’s just business as normal for Huawei, who has never officially sold a P-series phone over here. But then again, if Huawei hadn’t run into so many issues getting its phones into retail stores earlier this year, maybe the P20 would have been the first. Either way, it means us here in the States are going to miss out on what might be the coolest phone of the year.